6.77 points at 31 votes (rank 414). 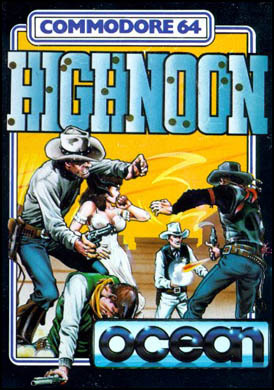 The player takes over the role of the sheriff of a small town, which is visited regularly by bandits who make robberies. They rob the bank and kidnap dancers from "Saucy Sue's Saloon". You can shoot horizontally, vertically or diagonally, the bandits answer back the same way. Lifeless bodies of shot bandits or of the player are disposed of by the undertaker "Rig + Mortis" by grabbing them at their feet and drawing them into his building. After every level there is a duel with a single bandit, where you either need good reactions or quick pressing of the button. 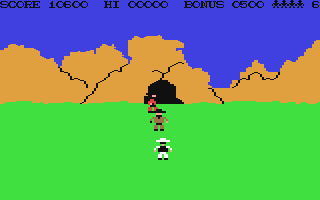 The fifth level doesn't play in the town any more, but outside in front of a cave. Every level offers new challenges. 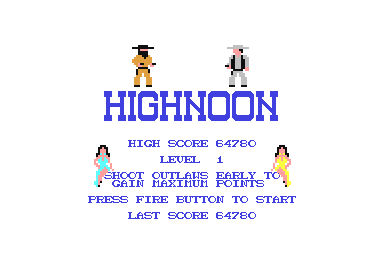 The game is limited to one screen and offers nice animated sprites, as well as not so good designed horses. Only in the last level (level 5) the scene changes, you find yourself in front of a cave entrance, the hide-out of the bandits. 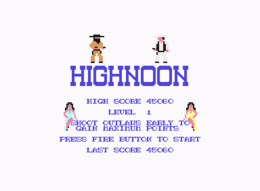 During the game the melody of the film "High Noon" with Gary Cooper from 1952 is played. The Sheriff follows the joystick movements. Shots can go into all directions. For this, first move the joystick in the direction you want to shoot, then press fire button. The undertaker, the girls from the saloon and the horses cannot be shot. At the end of each level there's a "duel". Here just wait until the opponent draws his weapon and then press the fire button as quickly as possible. After level 5 you get a bonus life and the game starts again with level 1. During the duel you can also press the fire button quickly in succession instead of waiting until the opponent draws his weapon. POKE 18033,255 gives you unlimited lives. Rockford: "This directly sets me back to my childhood days and the times with the breadbox. What's not to love? The nice designed sprites, the swinging doors, the undertaker, the background music, yes I even like the slow speed." Robotron2084: Despite the cute square graphics and really charming sound it was a bit TO slow for me. There are some twee gimmicks, but the tardy speed gets everything down. Watching Bonanza is more exciting. 5 out of 10 points." Klaws: The outstanding aspect of this game is the undertaker who "disposes" of the bodies. This beats the pants off the (even today still common) simple disappearance of the "tranquilised" enemies. 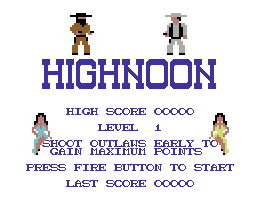 Otherwise it is a rather simply structured but very nice designed shooting game. Despite the slow speed of the pawns and the shots, you need to react fast in order not to get killed in the cross fire. I always liked to play this game now and then. 8 out of 10 points." Blubarju: "I also like the idea of the undertaker and of course the title song ("...do not forsake me, oh my darling"; I always have to sing along). Unfortunately, the speed is too slow. However, you can take out this little game every now and then for a few minutes. But not for longer. 6 points." This page was last modified on 17 March 2018, at 20:13.